During my visit to Brazil last October, I had the opportunity of attending the second of two international symposiums that were organized in conjunction to the 6a Bienal do Mercosul (6th Mercosur Biennale) in the city of Porto Alegre. Titled, “Art for Education, Education for Art,” the symposium brought together artists, critics and other types of cultural producers to discuss their (creative) practice in relationship to pedagogy. The conference key note speech was given by curator Bruce Ferguson, who is known, among many things, for co-editing the fantastic anthology Thinking About Exhibitions (1996) and for his tenure as dean of the school of arts at Columbia University in New York City from the late 1990s and until recently. Symposium participants included Roberta Scatolini, a researcher at the Paulo Freire institute in Brazil, artist Harrell Fletcher, who was a participating artist of the 6a Bienal do Mercosul, and Alfredo Oliveira co-founder of Radio La Colifata, among several others. The discussions were all interesting, yet there was one particularly moving –the one by Oliveira. He talked about the development of a radio program that is aired from Hospital Interdisciplinario Psicoasistencial Dr. José T. Borda, Buenos Aires. 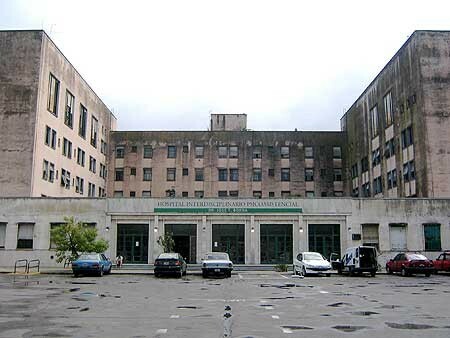 More commonly referred simply as “El Borda,” it is the largest psychiatric institution in Argentina and home of hundreds of people diagnosed with mental illnesses. With the assistance of Oliveira and a small staff and volunteers, the radio program is produced by and with El Borda’s patients. Recently, participants also include former patients who have been re-incorporated to “normal” lives outside of an institution. Inspired in part by how Oliveira talked about his experience with La Colifata* during the conference, I wrote a text about the 6a Bienal do Mercosul curatorial framework in general, and its pedagogical program in specific. The article is published in the current issue of Modern Painters (March 2008). It was with much curiosity and great pleasure that, a couple of weeks ago, while I was in Buenos Aires, I made my way to La Colifata. It was a Saturday afternoon when I went to Barrio Barracas to check out the colifatos’ live radio emission at El Borda. I wasn’t alone. The attendance was of about thirty people, two thirds of them El Borda patients who had “scheduled” (and prior to this, practiced) their live performance or who were there to listen; the rest were family members of patients and two or three visitors like me who were there to learn. Whether it was to give a recipe for a pescado a la mostaza, to sing the lyrics to a piece they had written (choir included) or to send a message, the Borda’s patients where pretty aware about what it meant to have a microphone on hand: they would be heard. *In Argentina, “colifato/a” is colloquial for crazy or loony.